Growing up in Houston I remember every summer and I do mean every summer my family would go to Astroworld. I also remember as I grew into my teen years I would want to go so much my parents finally purchased me a season pass. My group of friends and I all had them. My parents would give me twenty dollars and one of our parents would drop us off when the gates opened at 10:00am and then another would pick us up at 5:00pm. That was back in the day when 1. You could purchase more than two beverages and one hot dog at an amusement park for less than twenty dollars and 2. Parents didn’t have to worry about someone taking off with their child when they dropped them off for several hours of roller coaster riding. As a grown adult I still had a love that place and went several times. I couldn’t wait to bring my boys. I knew they would have just as much fun riding in the first and the last car of the Texas Cyclone as I did. But then in 2005 the park closed and it felt like a piece of me had died. I never did get to take my boys to Astroworld. They would never get to experience The Rainbo Bakery, where they served mini loaves of fresh baked bread with honey. No Texas Cyclone, Alpine Sleigh Ride, Excalibur, XLR-8, Greezed Lightnin, The Gun Slinger, Sky Screamer, The Viper, The Bamboo Chute, Thunder River, The River of No Return, 610 Limited Train, and so many more. 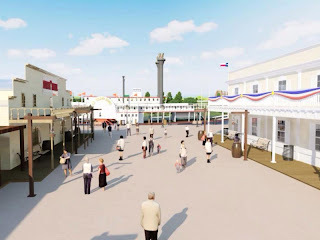 But alas, a new day is dawning in the amusement park world, Grand Texas Theme Park is in the works and I am HAPPY HAPPY HAPPY! XLR-8 & Greezed Lightnin were my favorites! Did you ever go to concerts there? I went to several when I was a teenager (Amy Grant & Michael W. Smith)! Chris actually played there when he was in a band, just before they closed. Good times... He worked right across Kirby from it a few years ago, and it was so weird to see all that empty space. The new park sounds like it'll be fun & a little bit closer to you, huh?